Such a beautiful location. The staff are so friendly and everything works like clockwork. Food and service was sensational. The rooms have the little touches includeclike sunscreen and hydration gel. The staff are just so accomodating and aim to please. 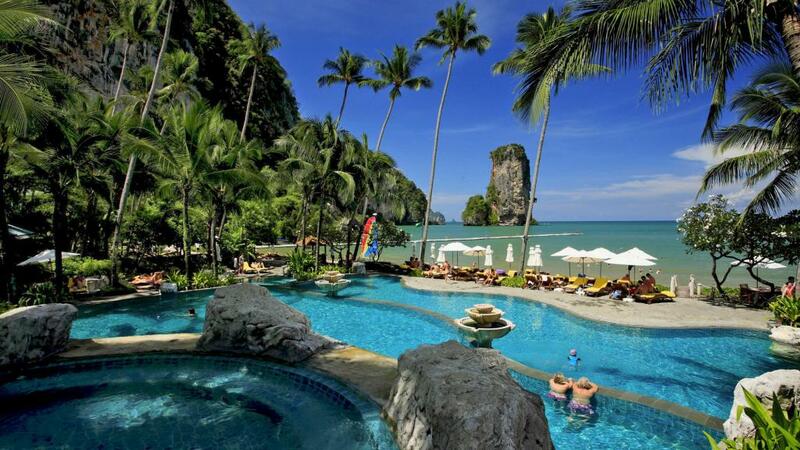 The best things about Centara Grand Beach Resort and Villas Krabi was the Club benefits, the swimming pool and the Thai Restaurant. The resort is set on a secluded bay only accessible by boat which means unless you stay on the resort and lounge by the pool or the beach all day you must take the boat or monkey trail to do things like visit Ao Nang which has a nice beach and many restaurants, bars and shops. We did enjoy the Club benefits which was part of our package that included breakfast being served at the Club ,along with afternoon tea and pre dinner drinks for an hour and a half. The Club staff look after all your needs and services including express check in and check out, organizing boat tickets or tours and anything you need for your villa . The Club staff provided excellent service. The Thai restaurant is excellent and high quality Thai cuisine and great service. The pool area is beautiful and the water is cool and refreshing . The beach however is small and the water is like a hot bath which is not enticing in hot weather. Overall we did enjoy our stay however it was way from perfect. I recommend this resort to individuals, couples and families who enjoy staying in a resort to lounge to eat and drink at the resort . What a fantastic place to stay, your first impression as you arrive on the speedboat is wow, the limestone surrounding cliffs and the beautiful resort set amongst this. The resort is perfect with staff that are so friendly, happy and willing to help you. Views from the rooms and the rooms themself are really nice, sitting on the balcony in the evening just perfect and relaxing. Kids had a ball with the pools, beach and meeting new friends. Go and explore as there are some great day trips on offer and with a short walk through the Monkey trail to Ao-Nang which offers great shopping and a new adventure experience. We will be back, thank you Centara. Highly recommend Friday night Thai buffet dinner with Thai entertainment. Only one minus was lack of staff knowledge about trips which we bought thru TravelOnline. Voucher stayed pick up from the hotel and they have confirmed it - yes from the hotel. On the day we supposed to go our pick up time have passed and when we asked the staff, they actually said that there is no pick-ups from the hotel. Luckily they were able to reschedule it. However, overall it was very pleasant and relaxing stay. Is probably one of the best locations we have stayed. The limestone cliffs, provide a amazing back drop, as does the magnificent green sea. Rooms were very spacious, particularly the balconies with day bed beds and block out blinds. The monkeys provided lots of entertainment, but are extremely game and are not scared of tourists. We would recommend this resort to anybody looking to relax. Excellent hotel in breathtaking landscape. Very friendly staff, excellent service including restaurants. Recommend!